Welcome to The Atlanta Opera’s brand new blog! We’ll be posting several times per week with news, photos, and more, so be sure to check back soon. To open this blog, we want to share our recently announced 2010-2011 season, which will be our fourth in the Cobb Energy Performing Arts Centre! In an effort to remain fiscally responsible during these tough economic times, we’ve scaled back to three productions, so we’ve made sure that our three choices all have great audience appeal, for opera aficionados and novices alike. This new season features Puccini’s beloved La bohème, Gershwin’s American classic Porgy and Bess, and Mozart’s funny and poignant Così fan tutte. This incomparable opera classic tells the tale of six penniless artists full of idealism, beauty and unbridled love. Their harsh encounter with the realities of life is heart-wrenching—don’t forget to bring tissues. Italian soprano Grazia Doronzio and tenor Bryan Hymel star as Mimi and Rodolfo, the ill-fated lovers. Doronzio is a recent graduate from the Metropolitan Opera’s Lindemann Young Artist Development Program, and New Orleans native. Hymel (pronounced “ee-mel”) is the Top Prize Winner of the 2009 Gerda Lissner Foundation Competition. Be sure not to miss great young artists in this ever-popular classic opera as we expect the two weekends of performances to fill quickly! Why this production is a must-see: Boston Pops conductor Keith Lockhart in his Atlanta Opera debut, Atlanta native baritone Michael Redding as Porgy, and The Atlanta Opera Chorus. 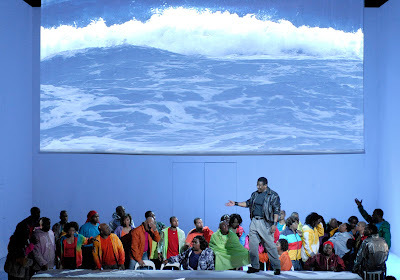 The Chorus, which is prominently featured in Porgy and Bess, received such great attention after The Atlanta Opera’s 2005 production that Paris’ Opéra-Comique commissioned them for a European touring production during the summer of 2008! Mozart’s brilliant masterpiece tells the story of two officers who boast of their girlfriends’ faithfulness, only to have a clever friend put it to the test. Disguises, charades, mischief, and heartbreak result, but in the end, all are much wiser in the ways of love. This production includes a cast of great up-and-coming artists! Soprano Kiera Duffy and tenor Matthew Plenk (Così’s Despina and Ferrando, respectively) are both featured in the Metropolitan Opera’s behind-the-scenes documentary, “The Audition.” “The Audition” follows the dramatic final week of the Metropolitan Opera’s 2007 National Council Auditions and is a great chance to get a rare behind-the-scenes look at what it takes to become an opera star! For more details on our 2010-2011 season—including casting and ticketing details—be sure to visit our new and improved website.